Is it snowing in Chacaltaya ?Bedankt! New information tells us that the rumour is true and Chacaltaya has officially closed. 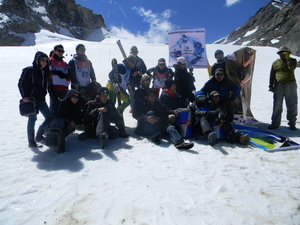 The glacier has melted which means that Chacaltaya was the highest ski area in the world. Was the only ski area in South America outside of Chile and Argentina. The most equatorial ski area in the world. The oldest ski lift in South America. The fastest surface lift in the world. The northernmost ski area in South America. The only ski area in South America with a season that corresponds to that of North America. The most difficult lift to load in the world. I lived in La Paz from 1972 to 1974 and was a member of El Club Andino. I skied up there a number of times and the experience was awsome. Yes, the belt, rope and hook for scooping the cable out of the snow was something else. Always came back down to the embassy with a monumental headache. The bus trip was incredible with wooden chairs stuck in extra down the aisle. Chickens and llamas also passengers. Never to be forgotten.